We would greatly appreciate if you are interested in participating with an artist profile in 'ARTISTS TO CV' that a new Masters of Today (MOT) art book project designed for contemporary artists, art galleries and art museums, to get on the most research-driven list of the worlds best active collectors and others who uses Masters of Today (MOT) art books series to permanent collect and review contemporary art. Masters of Today (MOT) and World Of Art (WOA) is one of the most vibrant artist-led publishing with international artists’ authors. 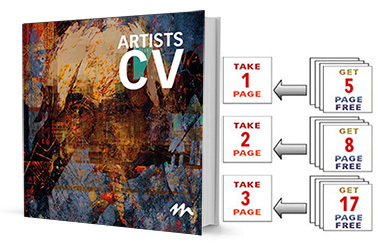 Masters of Today (MOT) published artists are selected for outstanding achievements in fine arts and art exposure. Their work is among the best and spreads new ideas. Masters of Today (MOT) Contemporary Artists Art Books Series includes the mixture of established and emerging arts professionals available to show and collect. In addition to the fine artists we publish we have many relationships in the art field and we are happy to assist artists in finding there place in art and art history.